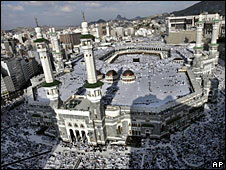 The meeting also reviewed what has been described as a Mecca watch, the brainchild of a French Muslim. The watch is said to rotate anti-clockwise and is supposed to help Muslims determine the direction of Mecca from any point on Earth. It is called "Ijaz al-Koran", which roughly translates as the "miraculous nature of the holy text". The underlying belief is that scientific truths were also revealed in the Muslim holy book, and it is the work of scholars to unearth and publicise the textual evidence. But the movement is not without its critics, who say that the notion that modern science was revealed in the Koran confuses spiritual truth, which is constant, and empirical truth, which depends on the state of science at any given point in time.